Spring isn’t bringing many showers this year, at least not in DC, but it is certainly bringing attention to ESSA’s new provisions and opportunities for states, districts, and schools. So this newsletter is dedicated to some of the best and newest of ESSA commentary and guidance. We hope you enjoy it as much as you are enjoying the gorgeous weather! 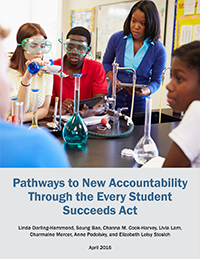 The right actions under ESSA will be critical in fighting the disadvantages that poverty and minority racial status pose for too many American children. But they will not be sufficient. Children of color and their parents understand all too well that the US school system is rigged against them, from before they even begin kindergarten. The timely new book Too Many Children Left Behind by education scholar Jane Waldfogel and four colleagues documents that not only schools but broader social systems conspire to put lower-class US children behind early and keep them behind in ways that similar countries do not. Indeed, generational poverty in the United States can feel inevitable. As a new Century Foundation study of at-risk youth from Baltimore’s Sandtown neighborhood demonstrates, it doesn’t have to be. But we need to be much smarter, more intentional, and willing to invest in their future, if we are going to break longstanding chains that bind. On the anniversary of Freddie Gray’s murder, this report’s call to action couldn’t be more timely. 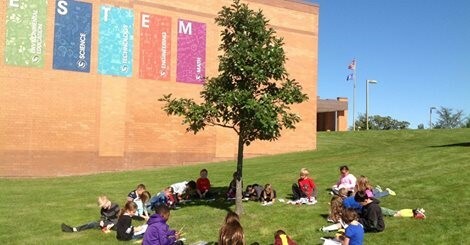 ge Elementary School in Prairie Lake Minnesota and getting kids outdoors all year long to learn hands-on from and with nature? It’s up to all of us to help them move in this direction. Thank you, as always, for your dedication to ensuring that all children receive a rich, comprehensive education and have the support they need to fulfill their potential. We look forward to continuing to work with you in 2015 and beyond, and to keep you informed of activities and policies that support a Broader, Bolder Approach to Education. Don’t forget to share our Facebook posts and follow us on Twitter!